This time of year, carrots are plentiful and inexpensive, but after many batches of roast carrots and roast carrot soup, they can become a bit boring. 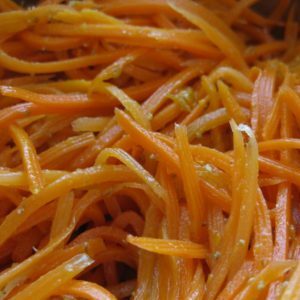 If you are looking for something new to do with all those carrots, this carrot salad is for you! (And if you have an abundance of cauliflower, I have an easy marinated cauliflower recipe too 🙂 ) The marinade is tangy and sweet and the ground coriander* gives it a nice wintery warmth. Plus, it’s a great way to get some raw vegetables in winter, ensuring that they retain all their nutrients in their uncooked state. I learned how to make this salad here in Ukraine. It’s called ‘Korean carrot’, but it’s really more Russian and Ukrainian than Korean. It’s ubiquitous here in Ukraine; I see it at pretty much every market and supermarket deli counter and it is used to make many other salads. I tried it for the first time fresh from an outdoor winter market in Russia and immediately fell in love! It’s easy to make, especially if you have a tool to do the julienning. If you don’t have a julienne peeler, food processor or mandoline, a normal grater works just fine as well. 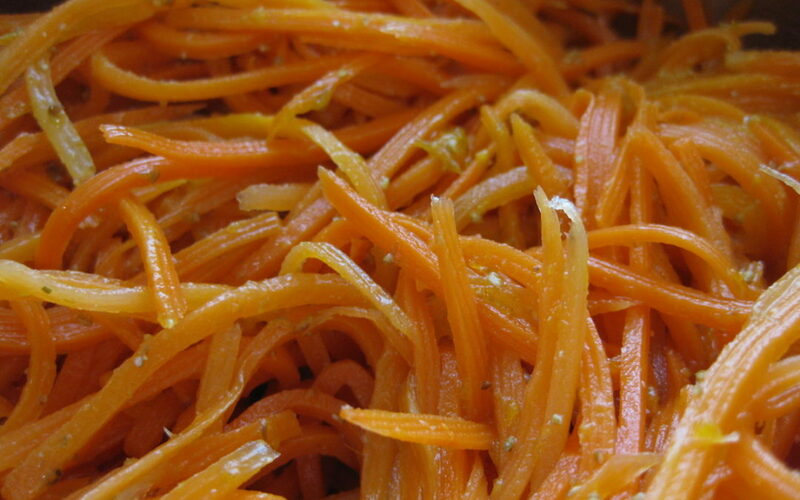 Grate or julienne the carrots and place into a large bowl. Sprinkle 1 tablespoon of salt over the carrot and mix thoroughly, using your hands to massage the carrot. Set the bowl aside to rest for ten minutes. The salt will draw the extra water out of the carrot. While the carrot is resting, in a small bowl, thoroughly mix all the other ingredients for the marinade. Using your hands, squeeze the excess water out of the carrots and place the squeezed carrot into another bowl. Pour the marinade over the top of the carrots. Stir thoroughly. Chill in refrigerator for at least four hours, preferably overnight. If you have a spice grinder, freshly grinding the coriander makes a huge difference! Use more or less raw honey to counteract the tartness from the vinegar, depending on your taste. If your julienner makes quite big carrot ‘matchsticks’, try boiling the carrots for five minutes to soften them a bit and skip the squeezing step. Grated carrot doesn’t need to be boiled. If you’re after a little (natural) sweetness, throw in some caramelised onions. If you want a little kick, add a clove of minced garlic. I skipped the honey because I’m avoiding sweeteners right now but I loved it! I also added parsley – is that ever done? Thank you for sharing! Thank you…cilantro does taste like soap. My family thinks I’m crazy! I can’t wait to try this recipe with my kids. Haha, I’m so glad I’m not the only one! I am also making this recipe tonight, because I’m going to use it to make another salad that I learned to make in Ukraine – so stay tuned for that one as well! I hope you love the Korean carrot. 🙂 Thanks for reading! I also add cayenne- about one-half of black pepper volume.